Born into a Bollywood dynasty, it's perhaps a bit unsurprising that Hrithik Roshan first appeared on film as a child. Hrithik Roshan is your Connector of the Day. After a short stint as an assistant director on films directed by his father, Roshan began to star in a spate of big banner movies. Roshan even brought India its first celluloid superhero in the movie "Krrish". Performances in other movies like "Jodhaa Akbar" won Roshan critical acclaim and numerous accolades at film festivals in India and across the world. 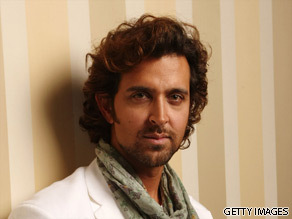 In 2010, Roshan starred in the film "Kites" - there was even an English version of the movie entitled "Kites: The Remix" which was edited by Hollywood producer, Brett Ratner. Today Roshan will soon become a splitting image of himself - at least in wax. He is the latest celebrity that will be immortalised at world famous wax museum Madame Tussaud's. Here's your chance to have your questions answered by this Bollywood superstar. what is your wish,which hasn't been achieved yet, regarding films ? Hrithik, do you think that you are overworking yourself?. I know it is challenging to make it in Bollywood and you have had to play every-role possible, not only because you love it, but because you had to make it against the four big Khans who were well established. Just relax brother all things will come to you. I want to watch more movies of urs...may 5 -6 movies per year...hehe..
on a serious note..we would like to really see more of hrithik....atleast 3 movies...please..
and was all that just for movie barbara mori and u...!! Hey Hrithik, you were great in Guzaarish & Kites! How far are you willing to go to fight poverty in India and what benefits can your stardom/fame bring along with the battle? My name is Sarah, I'm 33 years. I'm french. I would know if it has been difficult to go out of Ethan's character after filming ? Your performance is so incredible, magic. I'm really so impressed. For me, you win all awards : the big awards of heart! Thank you very very much to give so a so beautiful hope! u done a great job in kites & guzaarish. Hrithik realy u win our heart. Pls do like this a different movies. What is your take on Indian actors like Irrfan Khan & Anil Kapoor making it big in Hollywood? Also, have you given a thought to look out for meaty roles in Hollywood films? You would look absolutely fabulous playing James Bond! Hi Hrithik! Believe it or not, one of the first Bollywood movies ever I saw was Jodhaa Akbar last Dec 26. I was pleasently surprised to discover the caliber of a super star you are. Since then I've watched Akbar like 3 more times, Kites (3 times), Guzaarish, Koi... Mil Gaya, Dhoom 2, Kabhi Khushi Kabhie Gham... and I'm so frustrated I can't find more of your movies on this side of the world! BTW, Kites might have not worked that well in India, but it definetely was a winning formula for Western minds. I absolutely loved it! My question for you is: Do you have any plans to penetrate deeper in the Hollywood arena? I wish you greater success, congrats on your wax statue at Maddam Tussauds in London and many, many blessings for you, Suzanne and your 2 beautiful kids. Would you follow ur Father's footsteps and end up being a director and producer in the future? you and Aishwarya Rai are known as the golden couple in India, you've worked on three incredible movies so far can we expect to see you both together again soon? my all-time favourite Bollywood couple is you and Aishwarya Rai, you both won the official Star Screen Jodi No. 1 award so when will we be able to see you paired together again ? i just wanted to ask u have u ever considered doing a reality show about ur life Ex: Keeping up with the Roshans? hey hrithik. i've been your fan nd a fan of bwood for a very long time. i have been living in canada for about 11 years now nd i would really like to come nd be a part of bwood, although it would be hard as i am in toronto but would be willing to go to mumbai if given the chance. i am 16 years old and would like your tips on what i should do. i also really love pc so give my love to her. please get back to me if you can so we can talk more about acting together. If this message ever does see the likes of your eyes that in itself would mean a lot to me haha. Hrithik I've been watching your creations ever since Raj to Ethan where you have grown from an adolescent to an avatar of entertainment. Praise you i can forever, but I'm sure you are drenched with that regularly by fans. I simply ask...what is one motive that keeps you going in life? If one is to pursue a life of entertaining people, as you have, what should be his universal purpose of doing so? What has been yours? Clearly not money making as the bulk of bollywood actors seem to be doing for. –	When are you and your father going to create a Historical movie about the people of India, who were shipped off to Suriname and other parts of the world in order to Improve the Current Global Connections between India and the rest of the world? I am awaiting Hrithik Roshan’s replies. Hello duggu, sir........!! M like ur biggest fan of u in the world....... I hav been ur fan from ur first movie kaho na pyaar hai to guzzaarish.......... I have loved all ur movies...... I jus hav one request that u satleast act for 2 movies in a year... A humble request..... I hope to c u in lots of action movies.......... My one question is there any thing that u feel u wan to do in movie wise...... U kno some dream director or dream movie project or dream star cast.......?? Hey bro!!!!!!! I am also a huge fan of you since your debut in Bollywood. Every film that you have acted in I have probably watched each one so many times. My dancing skills have sparked ever since I have seen you in Kaho Na Pyaar Hai. I anticpate all your films eagerly one after the other. How is Agneepath coming along? Hows the diet going? When is Agneepath releasing? Krrish 2!, I am excited, when will it release? Sorry bro please dont be overwhelmed, you can answer any question that I have asked. I see tons of success coming your way. Take care bro and wish you and your family happiness! Bro I have heard that your right knee is hurt, how are you feeling right now? Have you treated the knee yet? 1. Will you be doing Shekar Kapur`s Paani? 2. What is the character you`ll be playing in Zindagi Naa Milegi Dobara(ZNMD)? 3. Any latest films you have signed other than ZNMD,Agneepath remake and Krissh 2? 4. And do you have any tips or advices for the the people whom will be joining the gym soon? hi how are you doing hrithik, YOU ARE OUR FAVOURITE ACTOR! What we want to say is that you look too different now than we saw you in kaho naa pyaar hai, sorry to ask but, have you done any plastic surgery or you have grown? wish you all the best. Your paraplegic role in Guzaarish is simply outstanding! Great job!Hopefully the World Movie Awards org. who just congratulate you on twitter will recognize your talent some day and reward you. Please slow down and don't put too much pressure on your knees as we want you around for a long time. I must convey this to you that Guzaarish has completely change my out look towards life. Thank you! My name is Sarah, I'm 33 years. I'm french. I love your last movie Guzaarish. I would know if it has been difficult to go out of Ethan's character after filming ? Thank you very very much to give a so beautiful hope! How are the workouts going for agneepath? And also make sure you keep running and swimming for your knee to get better. If one is to become an avatar of entertainment like you in mind, body and spirit...what is he to do or live by everyday of his life? I cannot wait to hear your reply to Mark's and Timoon from Francel concerns. Especially, Timoon from France since I have been concerned about your health. Please give all to God (WaheGuru), who and which is above and beyond all earthly personalities. Dear Hrithik, last year I was very sick and had lost all desire to live. It was the dark night of the soul. By chance I saw Kabhi Khushi Kabhie gaam and it was another world. It is such a beautiful movie. I must tell you that I never ever watch movies. Most of the time they are so uninspiring. It´s all about violence, killing and so on. It was a very pleasant surprise to discover there is a country in this world there is still respect for old time values and that films are produced based on them.I loved everything about Kabhi Khushi: the music, the dancing, the costumes,the story itself and much more. It called my attention the dancing of this young actor and from then on I see all the films of Hrithik from Kaho na.. to Guzaarish. I enjoy so much his dancing,his acting because he gives his heart and soul always to everything he creates. how difficult was it to become a super star, when the industry was already dominated the Big three Kahn's? what is the role, which you have not done yet, but want to do? do you wish to work in any Hollywood movie? do you have any future plans to become a movie director? Rate yourself from out of 10? How was it working with actress Barbara Mori in Kites and do you have any plans to participate in Hollywood films soon? Hi hrithrik, I'm ur no1 n biggest Nigerian fan. First of all, congratulations on ur success n awards. Ur performance in kite was da boom.still hopin 2see guzarrish.I lyk ur look nau cos u look all grown up bt I luvd it in krrish. U ROCK n I luv u. Pls follow me on twitter n u'll mk 1girl really happy. All da best. Hi, i am big fan of yours, please tell what´s the diffrence between Politics and Religion and please describe it in your way and how do you think about it! Hi hrithrik, I'm ur no1 n biggest Nigerian fan. First of all, congratulations on ur success n awards. Ur performance in kite was da boom.still hopin 2see guzarrish.I lyk ur look nau cos u look all grown up bt I luvd it in krrish. U ROCK n I luv u. Pls follow me on twitter @cutiemimz n u'll mk 1girl really happy. All da best. I,Always find it hard  get your movie in my country why? From Nigeria lol. You're quite the artist, but loosen up, love. Just watched your Koffee with Karan episode, and Sussanne seems so much more herself than you. You're beautiful, as a person and in what you do. There isn't anyone left to impress, so don't try so hard. Your passion is evident, and you know what, it's such a rare thing to have in this day and age, so just simply cherish your passion for what you do and you'll find yourself becoming comfortable with who you are. It's not about the film, the names and associations that go with it, the character you're playing, or how the audience receives it. It's about honesty and commitment to self, and enjoying it. I love you. I have loved you for as long as I have loved films. I'm proud of what you've achieved, in life and career-wise. Now find your inner confidence and peace, and learn to give yourself the deserved credit. Humility is overrated, as is altruism. Your fans will never, NEVER, leave your side. So, don't worry. Hai hrithik, i m big fan of you from indonesia,so many people from indonesia know about you,we have Hrithik Roshan Fans Club Indonesia on Facebook. Hi hrithik biiiggg fan of urs. I realy luv u as a fan for as an actor u r n the person tht u r no 1 like u. Wud luv 2 c u in a hollywood movie n luv 2 c u in a psyche or an obessive lover or a casanova role i was blown away by ur guzaarish performance do more films plz. Luv u always muaaaah. M also on twitter. How handsome u r ? U r my role model smart. People often say that they have a hidden dreams that they dare not tell, afraid if doesn't come true? Tell us what yours are? And if so why? Hi Hrithik... Loves from Turkey.. Its perfect to see you on different project. And I wish we'll see you more.. Have u ever been in Istanbul? And if not, do you want it? Finally congratulations for your good family life.. I hope I can see you once a time 🙂 Loves to you..
Hey Hrithik.................... u r ideal person 4 me. I have seen ur all films.My brother also likes u................................................................................................................Its my dream 2 see u. The filmfare award was not just at all. Shahrukh's performance was nothing compared to Hrittik or Pepli Live's performer Omkara Das Manikpuri. Its sad when some people try to reign the throne by force, not by talent. Hey Hrithik, you were great in Kaho Naa.. Pyar Hai & Kites! Hv a story 4 krishhh-3 . . . . . . . . . Interested?? From our watching in the crises we believe that cause will not result in peaceful way. I am big fan of Hritik roshan , crazy about his dance , I am intrested in making flash games, can create good games on koi mill gaya & krrish.